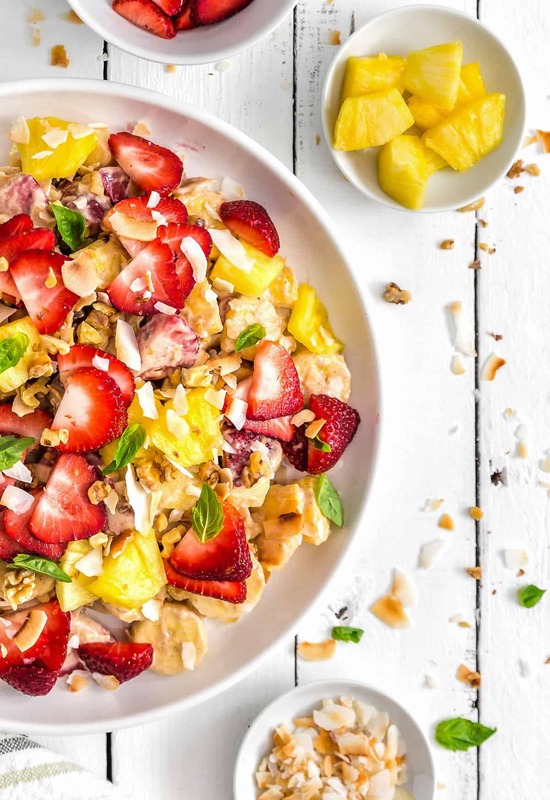 Sliced bananas, strawberries, pineapple, chopped walnuts, and toasted coconut flakes covered in a dreamy dressing is sure to put a smile on your face and become your next family favorite. This week’s Whip It Up Wednesday recipe is ideal for summer picnics or just plain fun. 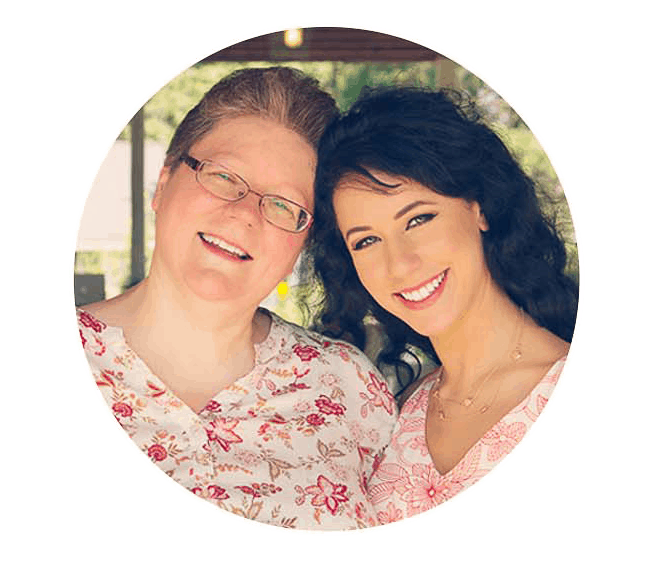 Whole Food Plant Based recipe, no oil, no refined sugar, no highly processed ingredients and gluten free. Who doesn’t love a delicious fruit salad? 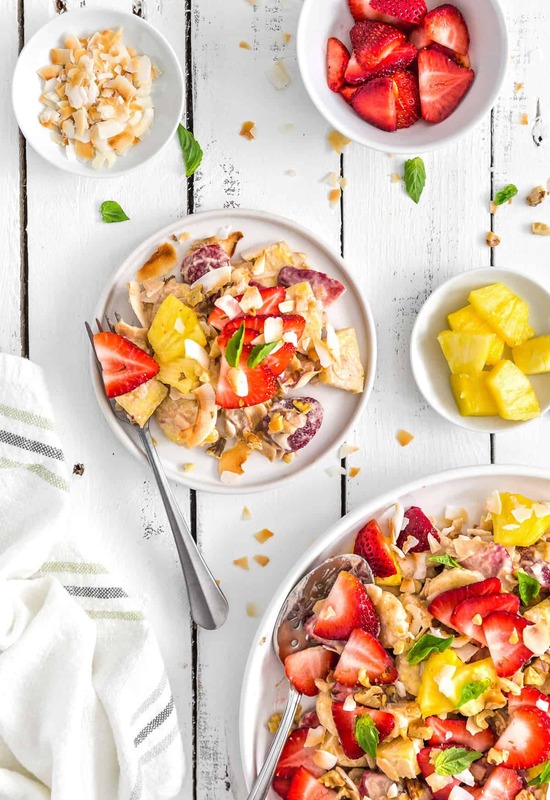 This tropical twist brings together fruit, nuts, and creamy perfection for this week’s Monkey and Me Kitchen Adventures Whip It Up Wednesday recipe. 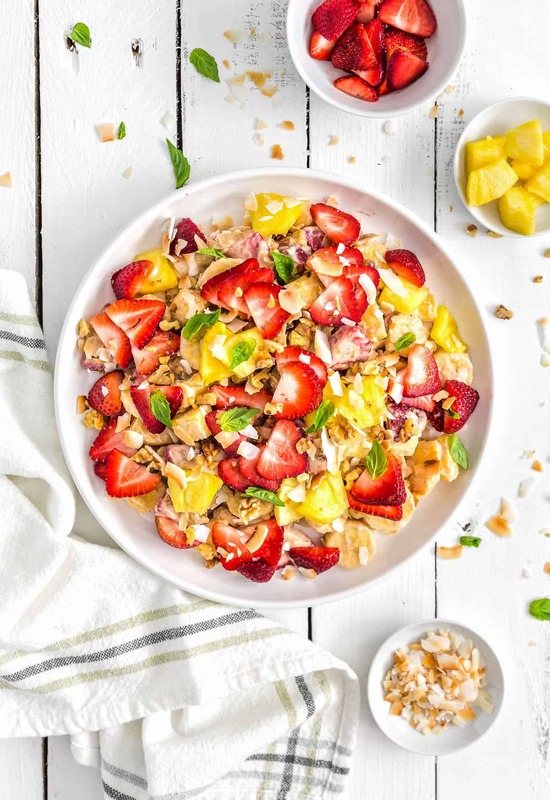 This week’s Whip It Up Wednesday recipe features a super yummy fruit salad that is creamy, fresh, and satisfying. Plain fruit salads are so much fun. I absolutely love fresh fruit, especially seasonal fruit. However, Mom and I wanted to make a fruit salad that had something just a little extra special to kick it up a notch. Creating a creamy dressing does exactly that. 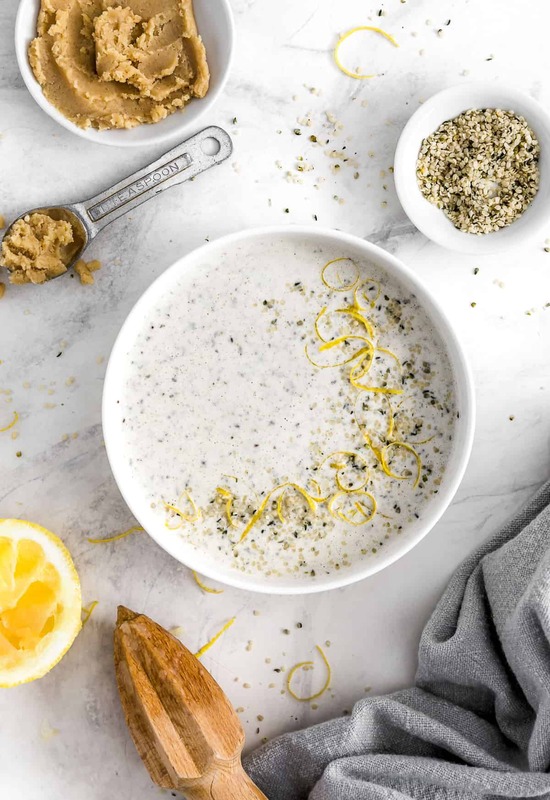 This lightly sweetened cashew cream dressing really hits the spot. Using dates is probably one of the healthiest way to sweeten a dish. We use them all the time in our recipes. However, one slight downside is that dates are brown, and when you use them in a cashew cream, they turn your cashew cream slightly golden brown. Normally, this is not an issue at all, but when you serve a dish like this to others, they may think that something is “off” with your fruit salad. Our suggestion is to dress the salad right before serving. Additionally, you may wish to advise any guests that the recipe uses dates as a sweetener so that is why the dressing is “date” brown. We also decorated the top of the fruit salad with fresh fruit. This helped everyone understand exactly what was in the salad. It is beautifully delicious. We hope you enjoy our new Whip It Up Wednesday quick and easy idea! 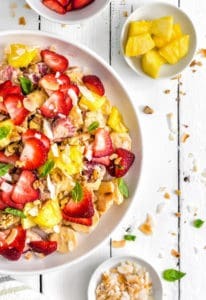 This Tropical Fruit Salad boasts sliced bananas, strawberries, pineapple, chopped walnuts, and toasted coconut flakes covered in a dreamy dressing is sure to put a smile on your face and become your next family favorite. This week’s Whip It Up Wednesday recipe is ideal for summer picnics or just plain fun. 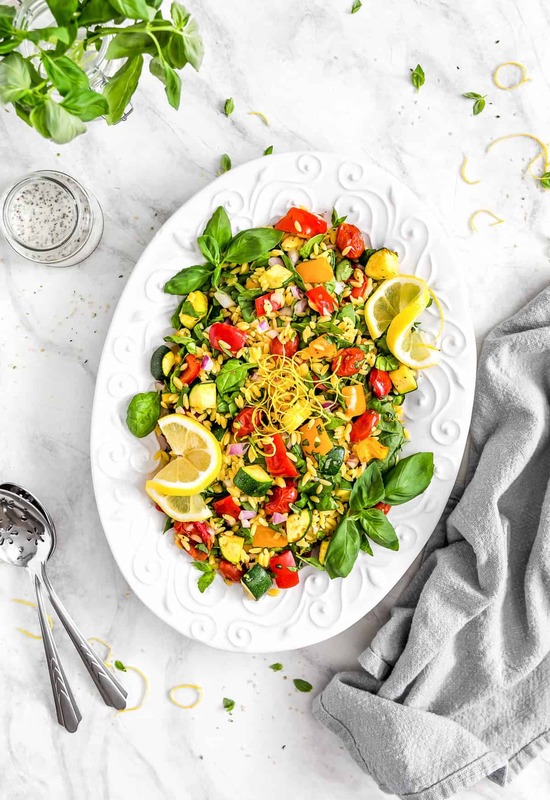 Whole Food Plant Based recipe, no oil, no refined sugar, no highly processed ingredients and gluten free. Soaking the cashews: Place 1/2 cup of raw cashews in a bowl, cover with water, and soak overnight. 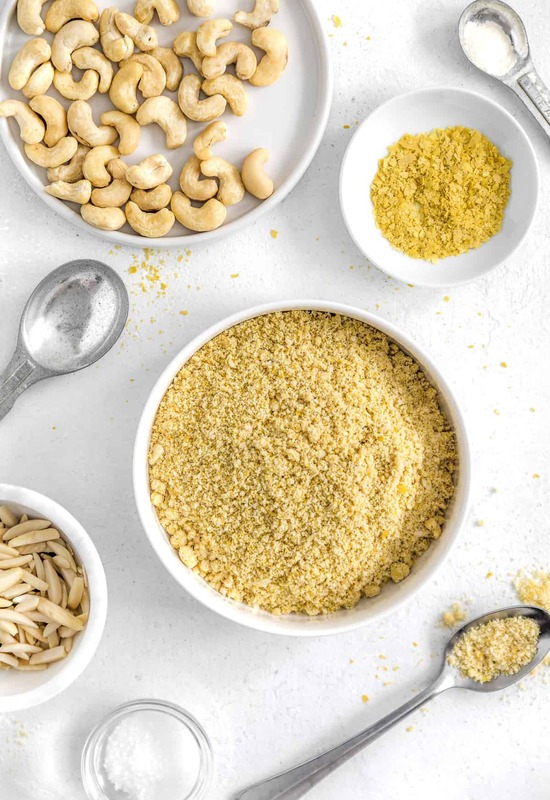 Quick Soak Method: Place ½ cup of raw cashews in a bowl, cover with boiling water for 20 minutes. Drain water when ready to use. If using Medjool dates: They are typically already soft and do not need softened further. If not using Medjool dates, then place the dates in a small bowl, cover the dates with boiling water and allow to sit for 10 minutes. Fish out the dates from the water, pinch it to ensure that there is no pit before using. Place all the Fruit SaladIngredients into a high-speed blender or food processor and blend until very smooth and the consistency is creamy. Refrigerate until ready to serve. Toast the coconut flakes in the oven by placing them on a baking sheet in a 350 F preheated oven. This only takes minutes so watch them carefully. Just toast them until they are golden. Remove and allow to cool completely. Prepare all the fruit, place in a large bowl. Do not prepare the bananas until right before serving as they tend to turn brown. Place all the prepared fruit in a bowl. Reserve some fruit, coconut and chopped walnuts for the topping. When ready to serve, place the Fruit Salad Dressing in a bowl and add a Tablespoon of unsweetened plain plant milk to thin out the dressing. This may require 1 or 2 Tablespoons. *Cashew Cream/Date Fruit Salad Dressing: Please note that using dates is a delicious and healthy way to sweeten a fruit salad; however, it does turn the fruit dressing a light shade of “date” brown. *Storage: Refrigerate, use within 2 days. Storage: Refrigerate. Use within 2 days.